Zachary David Alexander 'Zac' Efron (born October 18, 1987) is an American actor. He began acting professionally in the early 2000s and became known with his lead roles in the Disney Channel Original Movie High School Musical, the WB series Summerland, and the 2007 film version of the Broadway musical Hairspray. Efron has since starred in the films 17 Again, Me and Orson Welles, Charlie St. Cloud,… and New Year's Eve, and is due to star in The Lucky One. In 2007, Rolling Stone declared him the 'poster boy for tweenyboppers' and featured him in their late August 2007 issue. 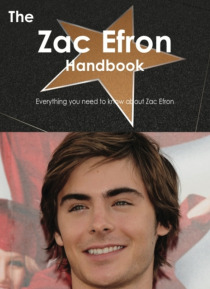 This book is your ultimate resource for Zac Efron. Here you will find the most up-to-date information, photos, and much more. In easy to read chapters, with extensive references and links to get you to know all there is to know about his Early life, Career and Personal life right away. A quick look inside: Zac Efron, Melinda's World, Miracle Run, The Derby Stallion, High School Musical, Hairspray (2007 film), High School Musical 2, High School Musical 3: Senior Year, 17 Again (film), Me and Orson Welles, Charlie St. Cloud (film), New Year's Eve (film), The Lucky One (film), The Lorax (film), The Guardian (TV series), Summerland (TV series), The Replacements (TV series), Heist (TV series), Robot Chicken: Star Wars Episode III.